We give you great North Georgia Cabin Rentals and a vacation experience that will bring you and your friends back for more. Come experience all the magic surrounding our Blue Ridge Georgia cabin rentals that we carefully select to ensure your next mountain vacation with us is close to all the great North Georgia mountain activities and outdoor action. 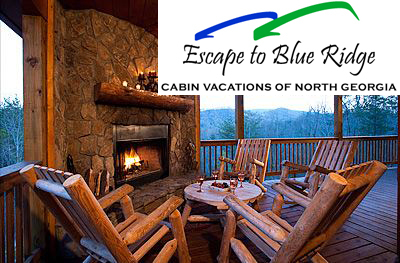 We love all the great North Georgia mountain scenery, crisp air, and awesome outdoor activities so much, that we created Escape to Blue Ridge™, so we could share our passion to create adventure vacation experiences for you. So we're not another executive or luxury cabin rental company that only focuses on the cabin's indoor activities that you could do at home. Instead, we provide unique Blue Ridge Georgia mountain vacation experiences that come with all the bragging rights and great stories you can share when you get back home. Our guests consistently say "I didn't realize that you could do all this great stuff so close to Atlanta". Our North Georgia cabin rentals are carefully selected to make sure that you're close to all the great things that will enhance your vacation experience like mountain rivers, creeks, waterfalls, lakes, hiking and biking trials, horseback riding, winery tours, scenic car drives or motorcycle rides, national forests, some of the best North Georgia fly fishing, and white water rafting facilities used during the 1996 Atlanta Summer Olympics. Remember our Blue Ridge Georgia cabin rentals are nestled in the North Georgia mountains just 90 minutes from Atlanta, so it's extremely convenient for quick city getaways and for our guest who fly in from out of town.